We are excited to announce that we will begin letting people into the private beta starting tomorrow. If you have already signed up for the beta then you will receive your email within the next week or so. If you haven't signed up, you can still do so at https://www.findarecord.com. To use the app, first fill out the search fields in the upper left hand corner. The Place field is a search box with autocomplete. After selecting a place, set your search radius and optionally limit your results using the from and to fields. Now click the Search button. Your results will show up as cards on the right side of the screen. If you hover over them, the locations they cover will appear on the map as red markers. 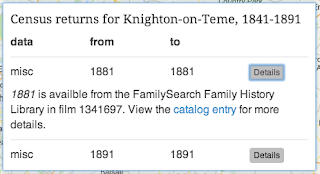 You can click on a result card to see what information is included. If you click on the Details button you will see how to access the records in that collection. Well that's it for today. See you in the Beta! How do we sign up for the beta Justin?